In other countries, the United Kingdom is generally reputated for having a poor food culture. Today I have decided to prove those stereotypes wrong, making you discover the finest of the British cuisine. Let me introduce you to a Scottish recipe : Scones. Spread flour on the countertop and put the dough on it. Roll the dough so it is round shaped and 2 cm thick (1/2 inches). Using a pastry cutter (or a glass of about 5-6 cm of diameter) cut the dough into wedges and place them on the baking sheet. Cook for about 12 – 15 minutes until golden brown. 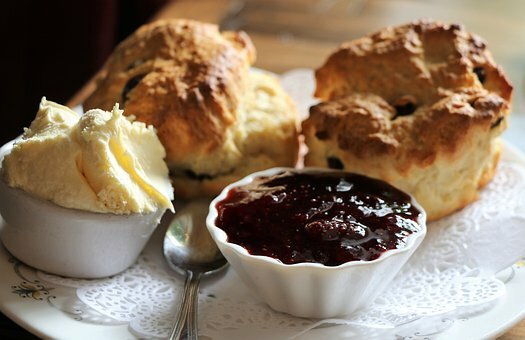 You can cut the scones in half and spread butter or marmalade on them. Enjoy them with a good cup of tea!